In a surprising move, Square Enix chief 和田洋一 / Youichi Wada announced the highly anticipated , and previously PS3 exclusive, Square Enix mega blockbuster RPG is to get an Xbox 360 version as well as the PS3 release, though the Xbox release will be restricted to European and American markets. 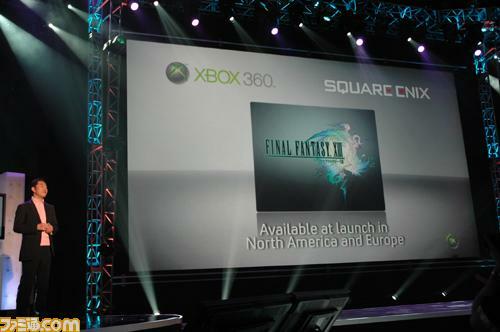 The announcement came unexpectedly at the end of the “Xbox 360 E308 Media Briefing”. Expect more details to emerge from press conferences later. Microsoft has been aggressively trying to rescue the Xbox 360 in the Japanese market with presumably bought and paid for “exclusive” (for a time at least) RPG releases; presumably this follows the same pattern, although getting a Japanese Xbox version may have been a bridge too far after all. Yeah, I was sorta mad when I heard this haha. But at least versus 13 is still a ps3 exclusive.